A sad time for our extended family as we grieve the loss of Nicholas who passed away unexpectedly in my mother’s arms at the veterinary clinic yesterday. He hadn’t been doing well. Old age, and its maladies, had crept upon him and finally taken its toll. Given to my mother as a four-month-old pup, Nicholas brought a puppy energy both enjoyable and challenging. In the end, he proved to be a wonderful companion for my mother and will be remembered for his quiet presence during possibly thousands of piano and voice lessons in her studio. And, of course, for loving his walks. Rest in peace, little Nicholas. 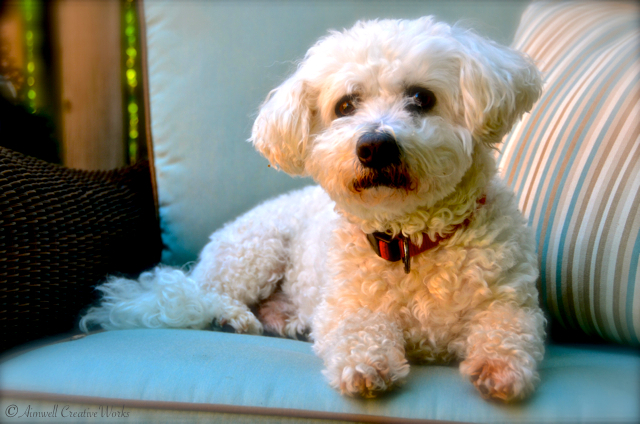 This entry was posted in Animals, Photography and tagged Aimwell CreativeWorks, Bichon Frise, dogs, Dorothy Chiotti, pets, Photography. Bookmark the permalink. Bless your hearts. He sounds like he was a wonderful little dude. (looks a lot like my own little munchkin). Hugs to you guys. Thank you. He was a sweetie.